Best Men's Acne Pads for Men with Salicylic Acid Treatment. Convenient acne treatment pads formulated with prescription-grade, maximum strength salicylic acid to completely clear and prevent breakouts and blackheads. Unique formula also contains glycolic acid, tea tree extract and witch hazel to remove oily residues and buildup, and maintain a clear complexion. 50 Pads. Formulated with prescription-grade, maximum strength 2% concentration of Salicylic Acid, these pads fight acne on face, neck, chest, shoulders and back, and help prevent breakouts and blackheads. Unique formulation also contains Glycolic Acid, Tea Tree Extract and Witch Hazel to remove oily residues and buildup, and help maintain a clear, acne-free complexion. Wash twice a day with the Daily Face Wash which has Glycolic and Salicylic Acid combined with a slightly acidic formulation to dissolve dull residues and grime without stripping the skin of its natural moisture. Follow with the Advanced Face Tonic to clear the face of buildup and excess oil which can clog pores and cause a dull appearance. 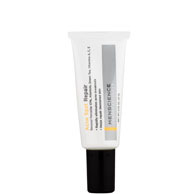 Next apply the Acne Spot Repair directly on blemishes and allow to completely absorb. Throughout the day, when washing your face is not possible or practical, the convenient Advanced Acne Pads thoroughly cleanse the skin of dirt, oils and acne-causing bacteria. Because of the high concentration of Glycolic and Salicylic Acids, it may take some time for skin to get used to the treatment. Begin with 1 application daily, then gradually increase to 2 - 3 times daily as needed. Once skin has become accustomed to the treatment, irritation, redness or dryness usually disappears. Discontinue use and consult a physician if irritation persists. What do you recommend for problem skin? No, it does not. When you tan, dead cells build up on your skin's surface. This can often cause pores to seem smaller and the surface to appear smoother. Tanning masks redness caused by acne, but once the tan disappears acne will become apparent once again. Exposure to the sun can also darken acne scars and marks, so protect skin regularly by using TiO2 Sunblock SPF 30 when you go outside. “Remove oily skin residues and buildup anywhere with these acne pads, and start pampering your acne-stressed skin with dermatological-grade ingredients." The Advanced Acne Pads have been a real game changer for me. They are convenient for when face washing is not possible or practical. I keep some in my desk at work and some in my gym bag. At work, I use them mid-day to refresh and clean my face and later I use them immediately after I work out. They have helped to keep my face and neck acne-free. I mostly used these after I finish at the gym. Helps clean my mug before I head back out. I was fortunate enough to not have had an acne problem as a teen However; into my late 30's I started to develop blackheads around my cheekbones. I tried so many products I can't even remember them all. That's probably because none of them were effective. 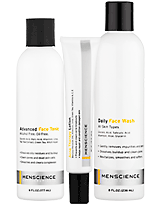 I tried the Menscience Acne Treatment Pads after being very happy with their other products. This is the most effective product I have found. Within a week of use, my blackheads were disappearing or shrinking. After two weeks, 90 percent are completely gone. I did notice some minor drying, but moisturizer took care of that very quickly. I cannot recommend this product highly enough! I have only used this product one time. I found that, in my case, there just isn't enough. I have acute adult "backne" so I have a larger area to cover and it takes four to six pads to cleanse the area, so fifty pads doesn't last me but a week when applying twice a day. I like the abrasiveness of the pads, it feels like they are just rough enough to take off the dead skin, but not irratate the area. They make my skin feel very clean and sterile if you can imagine that. They smell fantastic. After a day a work the Advanced Acne Pads are so soothing. After using one you know your face feels clean. An easy everyday habit to healthy looking guy's skin, no creams or lotions or smelly fruity cover-ups, just clean looking and feeling skin in thirty seconds a morning, or night. 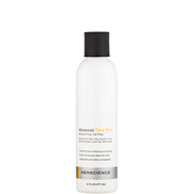 If dryness or peeling occurs, reduce application to once a day or every other day. If going outside, allow product to dry, then apply TiO2 Sunblock SPF 30. Highly effective natural ingredient to treat, cool, hydrate and help soothe the skin. Helps to improve the skin's texture, elasticity, firmness and smoothness. Plays a key role in the fight against free radicals. Advanced Acne Pads are a convenient and effective way to prevent and eliminate acne breakouts and maintain a clear complexion. The pads are saturated with a 2% concentration of dermatological-grade salicylic acid that fight acne-causing bacteria deep within the pores and clear oily residues that clog pores and lead to breakouts and blackheads. This scientifically developed formula also contains Glycolic acid and tea tree extract to wipe away organic buildup and dead cells, resulting in a clean and smooth complexion. Is it ideal for normal, combination and oily skin types.